There are many different kinds and types of printer paper, and one size does not fit all. In fact, a specific grade of paper that might be perfect for one particular task or purpose may be entirely unsuitable for another. Paper destined to be output on a desktop printer is generally divided into two distinct categories: photo paper, and everything else. In this article, we’ll talk about non-photo, general-purpose paper only. The CIE measure of whiteness is a measurement of the light reflected by the paper across the visible (daylight) spectrum. The CIE have set a standard of D65 illumination which is a standard representation of outdoor daylight under which the amount of light reflected is measured. For a perfect reflecting, non-fluorescent white material, the CIE whiteness would be 100, however most ‘white’ paper will have CIE whiteness measures of between 130 and 170 due to the addition of Optical Brightening Agents (OBAs) which are designed to reflect light from the non-visible range (mainly ultra-violet) back in the visible spectrum. Brightness, as specified by the TAPPI is the measurement of the amount of reflectance of blue light (Wavelength 457 nanometers, 44nm wide). There is also an ISO standard for measuring brightness (ISO 2469 – Paper, board and pulps — Measurement of diffuse radiance factor) but this is rarely used as the CIE whiteness scale is the more common measurement.As with whiteness it is common to see brightness measurements of over 100, which means that more light is reflected than was originally shone on the paper, this is due to Optical Brightening Agents reflecting part of the ultra-violet spectrum back in the visible spectrum. Measurement for TAPPI brightness are often in the 110 – 120 range, lower than commonly found CIE whiteness measures as the OBA’s only have a small spectrum to reflect. When you see a piece of white paper you may see it as having a bluish tinge or a creamy tinge to it, this is because it is very difficult to create a “true white”. A true white paper will reflect all the colours of the spectrum equally, whereas a blue white shade absorbs some of the longer wavelength red and green light and reflects more of the shorter wavelength blue light and a cream white shade absorbs more blue light.The shade of paper is almost invariably measured on the CIE LAB model (CIE L*, a*, b*) as this model covers the full colour space, whereas other models such as RGB or CMYK cover a subset of the LAB space.When selecting paper for printing a blue white shade is best for short documents as this provides the best contrast for black ink and gives optimum readability. However for book publishing a more neutral or cream white shade is often used as this gives less glare and produces less strain on the eyes over a longer period of reading. True white shades are often also used for printing when the document contains warmer colours in the red, orange and yellow ranges. 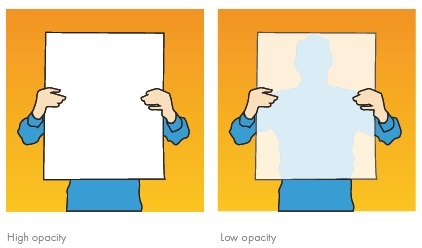 Opacity is the degree to which light passes through the paper. Most paper exhibits a certain degree of translucency, so if you hold it up to the light, you can see what’s on the other side. With some cheap paper, the opacity is so low that whatever’s printed on the other side will bleed through, whether or not you hold it up to a light source. For this reason, low-opacity paper is highly unsuitable for double-sided printing. As with brightness, the general rule-of-thumb: The better (more expensive) the paper grade, the higher its opacity. There’s no specific opacity grading scheme, though many manufacturers will describe their products as low-, medium-, or high-opacity paper. Weight is how heavy paper is. (This relates a little to the thickness of the paper, but manufacturing processes can bulk lighter paper to be thicker and less opaque). Heavier paper has a look and feel about it that denotes quality and importance, while lighter paper tends to have greater opacity and may impart a sense of cheapness (or the lack of importance of a document), and can be harder to handle (though it’s less expensive, and more can be stored in the same amount of space). The weight of paper in countries that use ISO paper sizes is defined by ISO 536 Paper and Board – Determination of Grammage. This standard defines grammage as grammes per square metre (g/m2) thus the weight of a single sheet of A0 paper defines the grammage of that paper type as the A0 size is defined by ISO 216 as having an area of 1 square metre. An A0 sheet of 80gsm paper will weigh 80 grams, an A0 sheet of 100gsm paper will weigh 100 grams and so on.Paper that is used in offices is usually between 70gsm and 80gsm. Some accountants and solicitors use heavier weight paper ranging from 90gsm to 120gsm for formal correspondence. Above 120gsm come various thicknesses of card with 160gsm and 200gsm being most commonly used for file dividers. Newspaper ranges between 45gsm and 50gsm. Texture, also known as surface or smoothness, refers to how the paper looks and feels. Depending upon a number of factors (such as how it’s manufactured, if it’s coated or uncoated, the percentage of rag to cellulose, if any recycled materials are being used), paper can be smooth or slick, grained or pebbled, matte or silk. Texture affects how ink or toner is deposited and spread onto the paper. The rule of thumb is that smooth papers work better on inkjet and laser printers, while textured papers are more suited for handwritten notes and special-occasion use, such as wedding invitations and birth announcements. For internal documents a consistent economy paper is perfectly acceptable. This would be upwards of 70gsm. We’d recommend A4E for local customers or 397921 for those further afield. 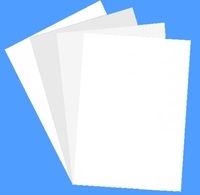 External documents particularly for marketing or presentation a Superior 90gsm paper would be very suitable. We’d recommend A490 or 377767. The common distinction between paper and card is at 160gsm. Card creates problems for some printers as it’s too thick to go around the rollers. We’ll cover card in a separate news item.